Over-the-counter cold therapies are often used to relieve cold and flu symptoms, but they come with a number of side effects. It is because these side effects that many over the counter cold and flu medicines have been removed from drug store shelves. Many physicians agree that there exist no safe over-the-counter cold remedies, in particular for children. Conventional cold and flu remedies do nothing to protect you against the cold or flu viruses and recent evidence suggests that these remedies actually do not speed up recovery from a cold or the flu. 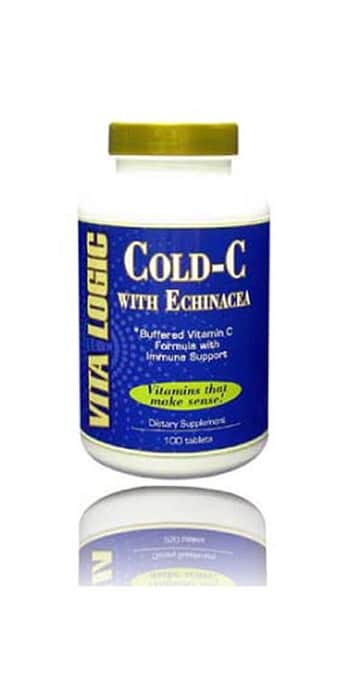 Cold-C with Echinacea by Vitalogic Vitamins is the best solution for anyone to prevent or treat the common cold or the flu. Start taking Cold-C with Echinacea as soon as symptoms begin and continue until you feel recovered. Or take it as a preventive measure when you have been around someone who has a cold or the flu. The ingredients of Cold-C with Echinacea have been proven to reduce the frequency, severity and duration of colds and flu with no known side effects. Vitamin C is known for its immune boosting properties and helps to repair tissue. Vitamin C in Cold-C with Echinacea comes in the form of Calcium Ascorbate, which is a buffered vitamin C to help prevent stomach irritation. Zinc is an important mineral that supports immune function. Zinc plays a role in many cellular enzymatic and hormonal functions and zinc is important in protecting tissue and wound healing. Echinacea purpurea and angustifolia are the popular medicinal varieties of this well known plant that have been proven to be immunostimulatory and immunomodulating. Studies have suggested that Echinacea extracts are able to counteract the (ill) effects of rhinovirus infection of epithelial cells (which line our airways). Citrus Bioflavanoids are antioxidants derived from plant pigments that help and balance our bodies' reactions to irritants and also support other nutrients that support our immunity and overall health. Rutin and Quercetin are potent antioxidants that are anti-inflammatory and help vitamin C to function better. Elderberry fruit is a powerful antioxidant and an immune system stimulator, which is often used to treat coughs, colds and bronchitis as it is suggested to act as a natural expectorant. Sharma, M., Arnason, J.T. and Hudson, J.B. (2006) Echinacea extracts modulate the production of multiple transcription factors in uninfected cells and rhinovirus-infected cells. Phytother Res. 12:1074-9. 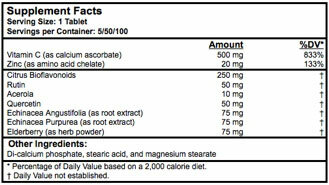 As a dietary supplement, take one (1) to two (2) tablets daily, or as directed by your healthcare professional.